Plans to spend £1.3m expanding an airport, creating 3,000 jobs, have been given the go-ahead by council chiefs. 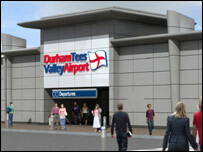 Currently one million passengers a year travel through Durham Tees Valley Airport, but plans have been unveiled to increase this to three million. The plans include a new terminal, car parks and taxi bays. People in nearby Long Newton believe roads would not cope with the extra traffic. But Darlington and Stockton councils have both approved the revamp. The second phase of the expansion would include a business park, with a 100-bed hotel, and a pub-restaurant which is being considered by Government North East. Hugh Lang, managing director at the airport, said a Low Newton interchange would be built to cope with extra traffic. He also said the revamp would create 2,000 airport jobs and an extra 1,000 "spin-off" jobs in the area because of the expansion and extra visitors. Work at the airport would not be completed until 2008.